Ever wanted to find out what it takes to join the 501st Legion? Wanna know what makes Darth Vader tick? Have you ever wondered why Boba Fett is just so damn cool? 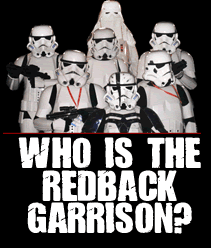 Make sure you come and visit us at the 2010 Brisbane Supanova convention and find out first hand! Troopers will be out in force, ensuring the galactic safety of all attendees! This entry was posted on Friday, March 19th, 2010 at 12:54 pm	and is filed under Garrison News. You can follow any responses to this entry through the RSS 2.0 feed. Both comments and pings are currently closed.